Gov. 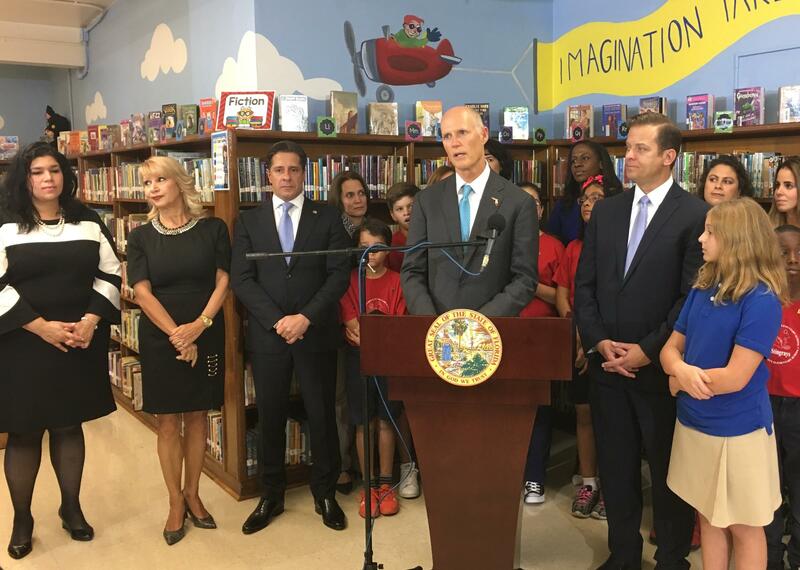 Rick Scott, Miami-Dade County Schools Superintendent Alberto Carvalho and other leaders discuss next year's budget during a recent press conference in Coconut Grove. Scott said he'll help districts get funding for new students from Puerto Rico. Nearly 10,000 students from Puerto Rico and the U.S. Virgin Islands have enrolled in Florida’s public schools since hurricanes Irma and Maria devastated the Caribbean. Education leaders haven’t yet quantified the financial impact of absorbing them into schools. But it’ll likely take a combination of funding from the state and federal governments to cover the costs. While visiting a Coconut Grove elementary school late last month, Gov. Rick Scott said the state has reserves that could be used to help. “We'll work with each of the school districts to make sure that they have the resources to be able to take care of these students,” the Republican governor said after holding a press conference to tout his budget proposal for next year. Also attending the event was Miami-Dade County Schools Superintendent Alberto Carvalho, who jumped in to support the governor’s statement that he has offered help to affected districts. “The very first question that the governor asked me was: ‘How many students have you received from Puerto Rico, from the U.S. Virgin Islands, and are you OK in terms of budget support for this year? If you see some additional needs, please give me a call,’ ” Carvalho said. The district has gotten about 900 new students after the hurricanes, mostly from Puerto Rico. But it’s not as simple as a phone call. Last week, state lawmakers asked Scott’s budget director, Cynthia Kelly, whether the governor would deploy emergency funding to the school districts that received the most students. The migration has been felt the most in the Orlando area, with the Orange and Osceola county school districts seeing overall enrollment increases of about 1 and 2 percent, respectively. In the 2018-19 state budget, which lawmakers are crafting now, any new students would be accounted for through the regular education funding formula, Kelly said. But the state will seek federal emergency assistance to offset districts’ unexpected costs this year. “That is the specific request we would make to the federal government,” Kelly said during a legislative committee meeting in the state Capitol complex. However, the state has made some budgeting changes to try to mitigate districts’ financial strain mid-year. Typically, schools report how many students they have in October, and those headcounts determine funding for the first half of the school year. This year, the state Department of Education allowed districts to choose later dates if they wanted because of the influx that followed the September hurricanes. Districts expected more students to arrive after the October deadline, but they weren’t sure how many, so several opted to push back the headcounts. Locally, Broward and Palm Beach counties pushed their census for selected high schools to mid-November. The Miami-Dade district waited until the first week of December for all of its schools. There’ll be another count in February that’ll be used to dole out per-pupil funding for the second half of the school year. That will capture any more students who arrive at the start of the new year. Education Commissioner Pam Stewart told lawmakers the actual cost of accepting the new students is hard to pin down, in part because some students are transferring between Florida school districts, which could inflate the numbers if students are counted more than once. She said she has asked some school districts to tell the state what they’ve spent so far — for example, on hiring additional teachers. Officials will take that into consideration in determining if any additional funding is needed. “Once we know all of that, we will be able to better make a decision, better make a recommendation, and determine what we should do about the students coming from Puerto Rico from a financial aspect,” Stewart said during a legislative committee meeting last week. Seven humanitarian groups from all over the country came together Sunday under the umbrella of the Puerto Rico Recovery Alliance to bring much-needed aid to the island. 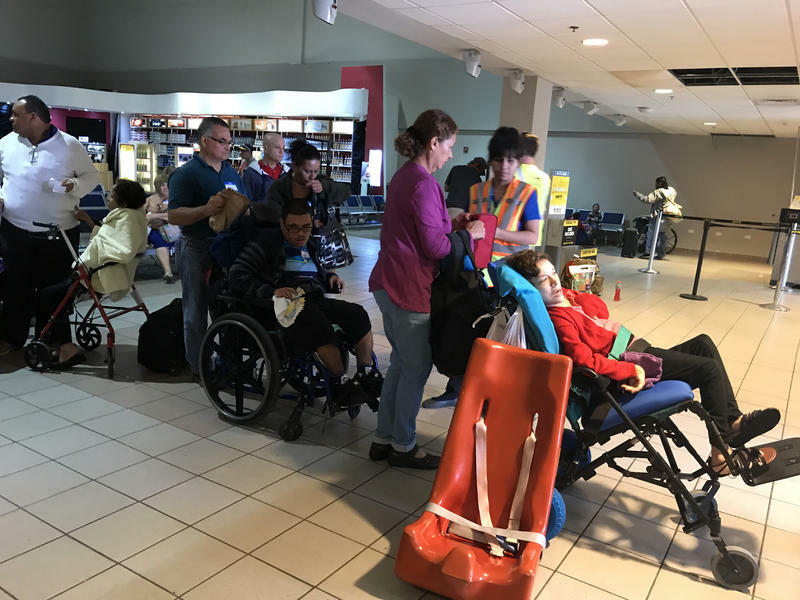 Ever since Hurricane Maria devastated Puerto Rico, the groups of volunteers that make up the alliance have been making individual trips to the U.S. territory to help. Their mission on Sunday was to deliver 30,000 pounds of medical supplies to hospitals in Puerto Rico — and evacuate about 80 people in need of medical assistance or other support they can’t get on the island.